Every day I wait for the train, stare at this sign and shudder. Who approved the abysmal grammar? Am I the only one who’s noticed, does anyone care? 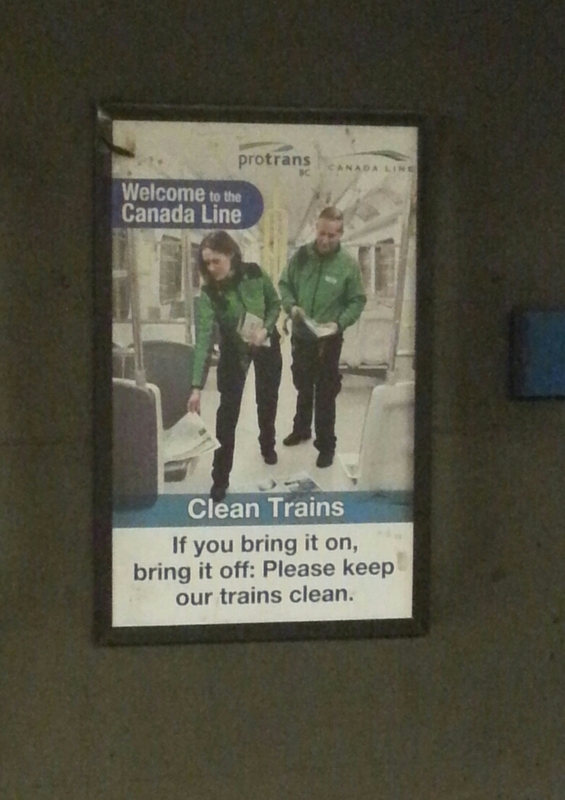 Did TransLink employees or contracted ad agency decide “bring it off” obviously followed “bring it on”? Do these nincompoops order “bring out” for dinner? Come on people. We bring things with us, take things away. We bring appetites to the dinner table, take our dishes to the kitchen. We take the garbage out, bring the bins in. This isn’t difficult. Slow down, ponder a moment – it’s glaringly obvious. TransLink, a mega corporation responsible for transportation services in British Columbia, has no excuse for sloppy grammar. Thanks to TransLink, I board that train grumpy, embarrassed and unlikely to “bring” anything off.